He's round with rosy cheeks and John Lennon glasses. A full white beard rests on his chest and the slippers on his feet cover a toe he injured somewhere along the way. Perhaps he stubbed it getting up for a cup of hot chocolate after falling asleep reading in front of a fire. I don't believe in a lot, but I do believe in the spirit of Santa. I knew the real Santa. 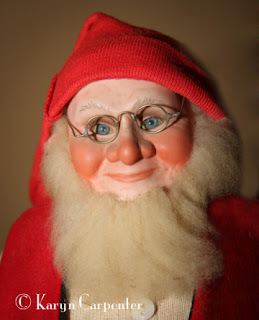 He looked nothing like the jolly elf you see in ads, shopping malls and movies. Santa was crusty. Kinda beat up. Instead of rosy cheeks, his skin was weathered and pocked from years working on a farm and in the coal fields. His smile was off-kilter, perhaps the effects of a stroke. He didn't smell the best. Kinda smelled like old flesh. He had one bad eye, and that one kinda oozed as time went on, but the good one twinkled from a goodness within. His name was Henry Krantz. He's one of those jewels you rarely hear about because he and his kind are tucked away in nowhere. Henry was probably as poor as they come. Instead of a fancy red suit, he dressed in worn overalls. He lived in a simple house in the country and had a falling-down barn with an old horse in residence that was more beat up than Henry. Henry loved that horse, but Henry had a soft spot for those less fortunate. Every week, Henry made the rounds of local businesses asking for donations and he'd collect a dollar or two, then he'd invest in a little sugary cheer. He'd pop into the hospital and nursing home and pass out candy. "I walk into a room and say 'you look like hell!'" he told me once. "People are there because they are sick, they don't want someone telling them they look good. Tell them they look as bad as they feel." Henry may have been the only visitor people had all week. But, Henry's real calling was for the kids. All year long, Henry collected toys - old broken toys that we lucky kids had no further use for. Toy cars with broken doors, fire engines missing wheels, plush dogs missing ears and stuffing, and dolls who's heads had fallen off and were missing eyes. And, after collecting these hundreds of toys, Henry sat in his workshop and made them new. He painted, fixed, stuffed. He inserted eyes and reattached limbs. He found a woman with a sewing machine who made sure that no doll went naked. Then, every year on Christmas Eve, Henry donned a cheap red suit, boots and smelly white beard and made the drive to "The State Training Center", the area residence of so many mentally handicapped individuals. Many of them were forgotten during the holidays, and Henry made sure those kids knew that they were special in the heart of Santa. Henry was the real deal…….. But the guy in the red suit? He sits on my mantle this time of year. A reminder of Henry and the real Santas of the world. One of my Mother's best friends, Charlene Westling, knew the pain of having a child severely affected with Downs Syndrome. Charlene was an angel. She became a doll maker, and for her special Santa doll she used the face of her father who was also a farmer, or some such thing.Though tall and lanky, there is no mistaking that her Santa has the face of her Dad, and probably embodies his spirit as well. There's real goodness in the man's face. 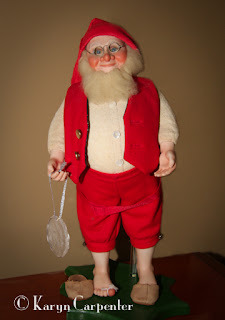 Charlene's Santa reminds me that, while I personally could do without this time of year, the true spirit of the season, the spirit of Henry Krantz, is something worth honoring. Great Post. Hope your day was blessed. And yes its over now.